One of the most intriguing (and headline-grabbing) TVs from CES 2019 was LG’s rollable OLED, which seems to appear out of thin air from the base of a console stand to produce a gorgeous TV where before there was none. While Bang & Olufsen’s tour de force for 2019 may not roll up and down like LG’s version, the luxury brand’s new Beovision Harmony OLED television certainly makes its own impressive, automated entrance. 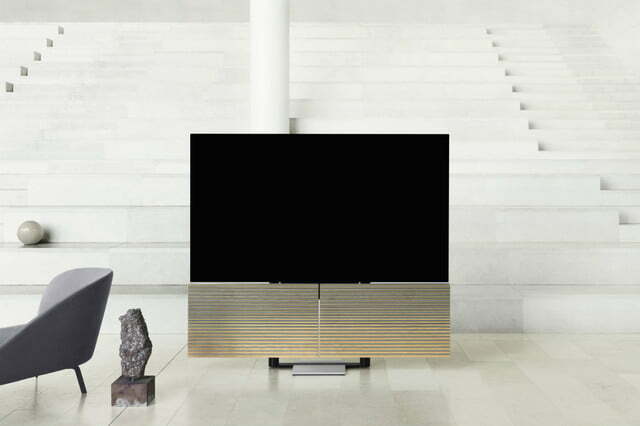 The Harmony is a transforming piece of art that reveals a 77-inch OLED from behind an oak or aluminum cover. As shown in the accompanying video, the massive 77-inch screen (which also comes from LG’s OLED factory) rises from behind its wooden cover at the press of a button, while beneath it a Bang & Olufsen-tuned sound system locks in place to create a sleek and powerful cinematic experience from behind its artful exterior. While the slotted, oak cover looks fantastic, it’s not just for show. 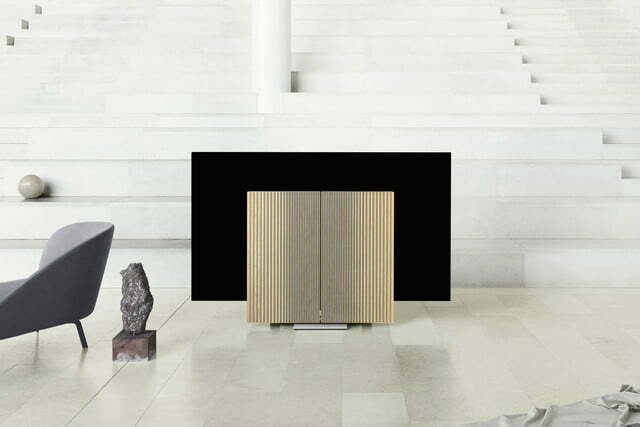 Bang & Olufsen claims the grading pattern is designed to maximize the acoustic performance of the speakers within, in the form of a three-channel “sound center” complete with DSP. The idea behind the TV, as Bang & Olufsen’s Executive Vice President of Brand and Markets John Mollanger tells it, is to create an immersive cinematic experience that can tuck itself away to blend in brilliantly with your decor when you’re not watching. “Pristine picture performance combined with truly immersive sound ensures a mesmerizing viewing experience. But the presence of a big screen is rarely a welcoming addition to living spaces. With Beovision Harmony, we wanted to create a meaningful object for interior that reduces the visual presence of the TV and transforms it into something that people will develop an emotional attachment to,” said Mollanger. The display itself is LG’s highly anticipated C9 77-inch 4K Ultra HD OLED TV, a $7,000 TV with all the fixings, including LG’s lightning- fast A9 gen-2 intelligent processor, HDR10 and Dolby Vision HDR support, and built-in Alexa. Other features include AirPlay 2 support, built-in Chromecast and Bluetooth, and webOS 4.5 for a wide variety of streaming apps. The C9’s predecessor, the C8, earned a 5-star rating from us last year, along with our Editor’s Choice award, and it was also our pick as the best TV of 2018. As for the sound, along with the pre-installed three-channel sound system, the TV is compatible with Bang & Olufsen’s ever-expanding multiroom speakers, allowing one to connect up to eight speakers for true 7.1 surround sound. Bang & Olufsen says all sources can be controlled with the Beoremote One, a single piece of aluminum that should marry well with the rest of the luxury experience. 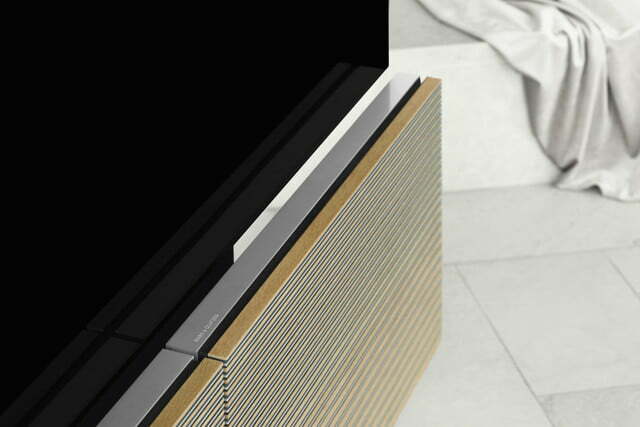 In place of the oak front panels, the TV will also be available with aluminum panels. You’ll pay a hefty price for all that lovely technology in such a pretty package, of course, as the Harmony will retail for $18,500 euros ($20,800 U.S.) when it arrives in Bang & Olufsen stores in October 2019 (with stateside pricing yet to be announced). The TV debuts today at Salone Del Mobile in Milan, Italy, alongside a retrospective of Bang & Olufsen products from across the brand’s storied history.